Regular readers will know that I like to get the most out of my money and when I first took a look at travelling to Italy I knew it was going to cost more than our usual holidays. Still determined to get the costs down I had a look into ways to make it cheaper. Obviously you could drive via France but I am not sure just how cost effective this is when you consider the tolls, fuel and wear and tear on the vehicle. Plus it makes me really tired to travel too far in the car so then I have just wasted some of the days paid for. The first thing I saw was a package holiday all-inclusive for £2,500 (during school holidays in the Easter break). This would mean that everything was covered in a nice part of Italy. I went from there and discovered that for the same money we could actually explore Italy and not be restricted to where and what we ate. 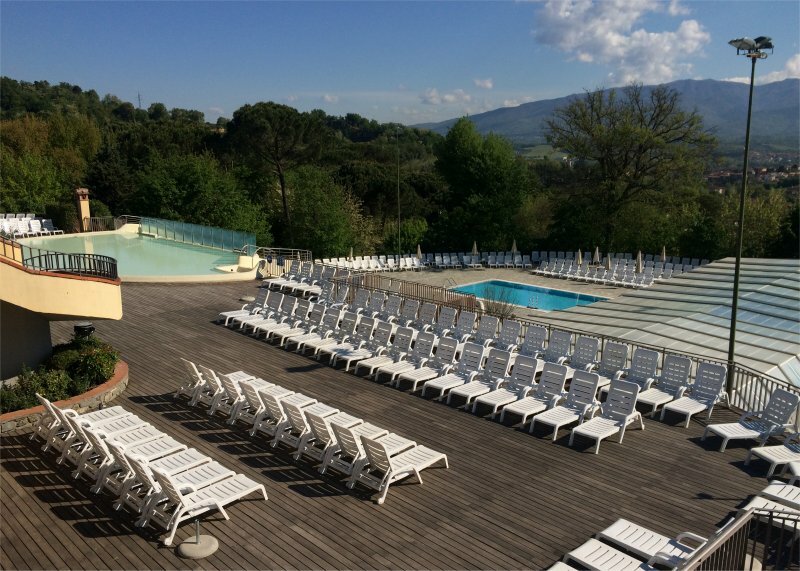 I booked through the Daily Mail holidays (The Sun £9.50 Holidays would be just the same) and went for the Norcenni Girasole Club Campsite in Figline Valdarno, Tuscanny. This two bedroom accommodation for the week including two Bank Holidays (in the school holidays) for five of us was around £250 – including all the sheets, towels, washing up stuff and toiletries (so I didn’t have to worry about getting them on the flight). To make it cheaper I could have taken these off (and to be fair the toiletries were only tiny!) There was entertainment provided on the campsite as well as swimming pools (although many did not open until the day after we went home, there were still four open). As I say you could drive via a ferry to France but we decided to fly. Italy has a really good transport network and so we decided to fly into Pisa because this was much cheaper. We also figured that it meant we got to see more of the country too. 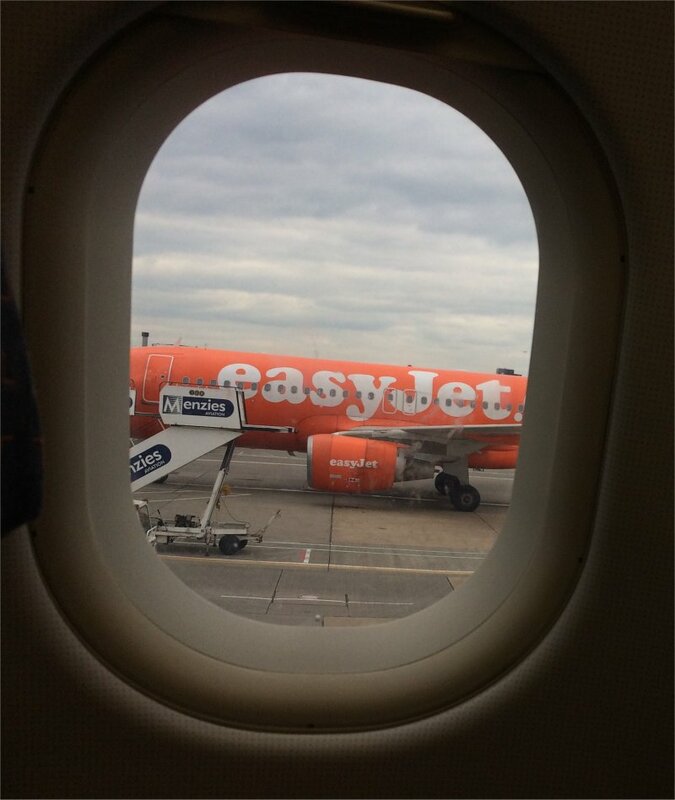 I picked budget airline EasyJet from London Gatwick as this was the cheapest option for us with flight times which I felt were reasonable and not going to be too hard on the kids. It also meant we flew back late on the last day of our holiday to make the most of our time there. I did pay for hold luggage and selected seats as it was our first time as a family but neither were needed. I was told as long as you check-in as soon as possible you should get seats all together. I wasn’t about to take that risk and also wanted to let the children each have a window seat. They also had a great family check-in service at Gatwick. What we hadn’t taken into consideration (initially) is a delay to our flight meaning that there were no connecting trains running to reach Figline Valdarno. We had originally thought of hiring a car but decided that we did not know enough about Italy’s roads to drive a left-hand drive car. Luckily we booked a hotel for our stay either side of our flights (we were heavily delayed coming home too and would have been too tired to drive home). We found these on Booking.com – which I have always managed to find places to stay at a good price. The hosts were fantastic at both places too and accommodating to our late arrivals. We decided to drive down to Gatwick (again for ease with the luggage) and probably in itself cheaper than coming down on the coach. But this meant we needed airport parking. We used Purple Parking at the airport – but actually there are cheaper options – including using EasyJet. I think that the best we could have parked for was £4 a day at the Four Seasons Guest House. Public transport around Italy cannot be purchased on board. We bought our train tickets online before we left – this meant that I could see exactly what I was paying and weigh up the costs of whether it was cheaper to fly to Pisa. It also meant that we did not need to get our tickets validated before we boarded. However, we were unaware that it was not possible to travel from Figline Valdarno railway Station to the campsite without arranging a taxi (or knowing the times of the shuttle bus). As it was only 2km away we had planned to walk it – but this is NOT safe (especially with luggage and children). We were VERY fortunate that a wonderfully kind man was going by on his motorbike and stopped and asked us where we were going. He then went out of his way to go and fetch his car to drive us to the campsite. For the rest of our holiday we had to rely on the shuttle bus or order taxis (which were expensive). This meant that we had to be ready to leave by 8:30am in the morning to get to the train station in order to use the shuttle bus. If I had realised this I would have booked an earlier train. Another thing to think about is the food. We had already decided that we were going to spend more than usual and eat out more so that we could sample as much Italian food as we could. There is a supermarket on site but that made things expensive and limited choice. In fact we found it hard to locate where you could buy food to take back and cook elsewhere – and it was actually not much cheaper than eating out! (Apart from the market in Florence). It is possible to hire a car in Italy but everything I read suggested that you really wouldn’t want to drive into the busy areas and that the transport system was really good. 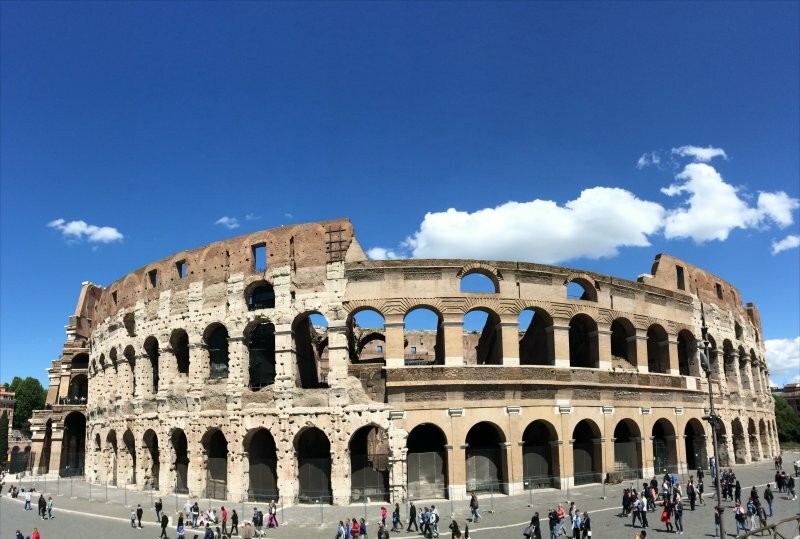 I had booked a trip to Rome before we left home by going on the train – and even with the extra cost of the taxi back to the campsite it was much cheaper than the Eurocamp excursion. I think it just depends on how easy you want things and if you are prepared to work between the times you can get to the train station – or pay extra for a taxi. To make trips out cheaper book in advanced to any attractions you wish to see. We got tickets for the Hop on Hop off Cruise in Rome by using AttractionTix. We did also utilise a few of the Eurocamp excursions but mainly because we were not prepared and didn’t realise how hard it would be to get to and from the camp. All in all visiting Italy wasn’t the cheapest holiday we have had but we did see more of it than we usually do and had the luxury of not having t drive and/or travel for ages so were not tired and grumpy. Easyjet even gave us 4.50 Euros each for our delay in getting home and so we received free ice-cream. If they had landed an extra 15 minutes later we would have also been entitled to compensation! But if on the other hand you want to take a luxury trip to Rome then check out Wandermust Family’s post on things not to miss. 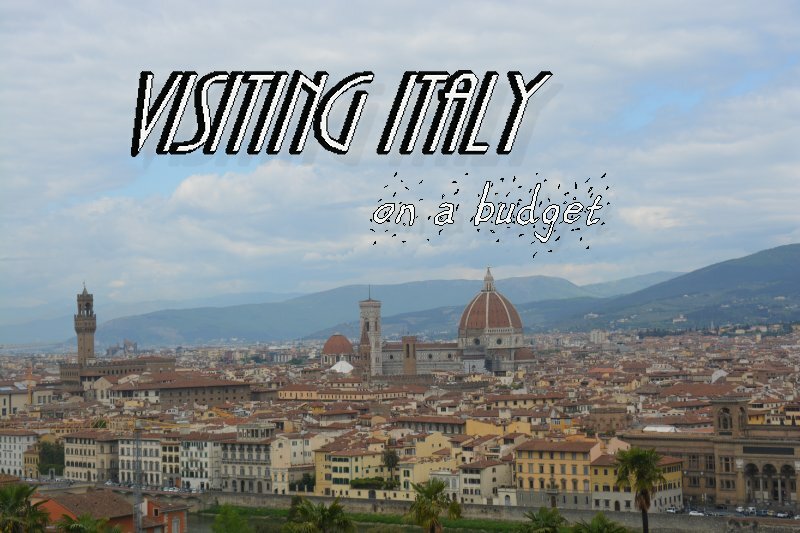 Do you have any tips on making a visit to Italy on a budget? I received tickets from AttractionTix for the Hop on Hop off Cruise in Rome. All opinions are honest and my own. These are great tips! Strangely, we have done a budget holiday to Italy too, albeit pre-kids. We flew to Rome for free using airmiles from tesco clupcard points and then camped while we were there. A little out of the centre so it was cheaper. That’s a really good idea hadn’t thought about my Tesco Clubcard points (which I actually use on the Ferry). Have just spent them on a Cineworld Unlimited card mind. Fantastic post this. I’ve been to Italy a few times and it’s an amazing place with something for everyone! This is so helpful! We are off to Italy in September and doing it all by rail! I was a bit worried it would cost a lot of money for the accommodation but I’ll keep an eye out for special deals. I hadn’t even considered a campsite. Italy is on my bucket list so i have bookmarked this post. I would love to visit with my mum as we ae always saying how pretty everything looks so to be able to do it all on a budget would be great! It’s not easy doing Italy on a budget, so you did well! I’m not surprised you didn’t want to drive – the roads are horrendous! When we went to Rome, we just walked everywhere! Interestingly, we flew to Italy on Easyjet from Gatwick a few years ago and got delayed on the way there. I love these types of posts – right up my street. Purple Parking is great but another one to mention is Just Park – where you park on people’s drives and pay half the price. There are plenty around the airports and some residents even offer a pick up and drop off offer! Great post. Been to Milan once. It was a lovely experience. The cabs were affordable.